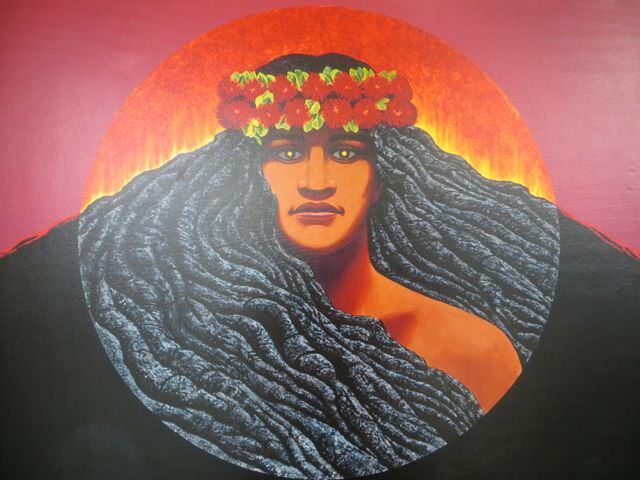 Pele Goddess of Fire according to Hawaiian legend. Before I went on my around the world trip, volcanoes were the stuff of legends and far-off, exotic places. Landing in South America and progressing on through Central America, I came foot to crater familiar with these fascinating creations of nature. It was an obsession I developed quickly and is one I’ve yet to shake, so the fact that the Hawaiian islands were a string of inhabited volcanoes had me sold. And Big Island was home to one of the most active volcanoes in the world? Get me a flight! After experiencing volcanoes in their raw, natural form in Latin America, where hiking and a fair level of fitness was required to get the full experience, I was surprised and a bit unsure about the fact that Big Island’s volcanoes had been encapsulated in a formal, well-tended, National Park complete with paved roads, restrooms and a museum. However, after hiking Diamond Head, which had also been given the wonderful USA safety treatment, I realised that there was something fantastically accessible about Hawaii Volcanoes National Park. With maps, well-marked trails and primely positioned viewpoints, the National Park Service had kindly taken this natural wonder out of the domain of adrenaline focused adventurers and made it accessible to everyone. Sure, there are some more challenging ways to explore the park with permit only hikes but I was quick to appreciate that, for a change, I didn’t have to pick a trail through the volcanic rubble. In boasting terms, the Hawaii Volcanoes National Park includes the world’s largest volcano, Mauna Loa, which is 17,000 metres (54,000 foot) when measured from the sea bed to summit – that’s more than 10,000 times my height and even bigger than Mount Everest! It’s also a little older me at around 700,000 years old, of which around 400,000 of those years have been spent above the surface of the ocean. Not only that, Mauna Loa is so dense that is has caused the ocean crust to warp into the earth’s mantle. Something, thankfully, me and my cake-eating tendencies have never had the embarrassment to have to admit to. These days, or since 1984 at least, the volcano sits relatively restful…but scientists say that signs of activity are increasingly showing. 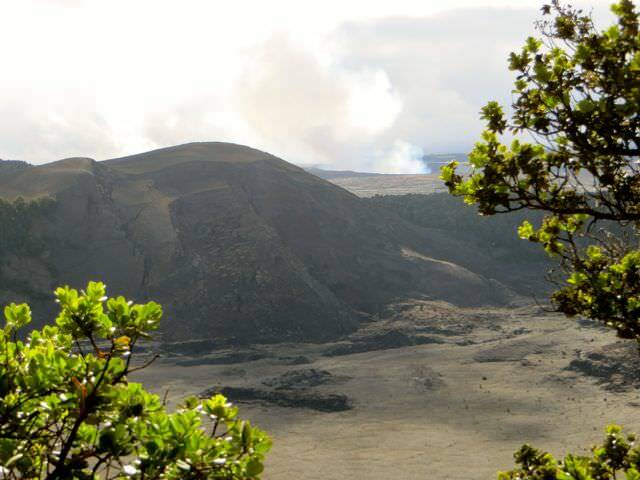 More interesting for many visitors to the park is Mauna Loa’s smaller counterpart, Kilauea, which can proudly take the title of the world’s youngest and most active volcano. 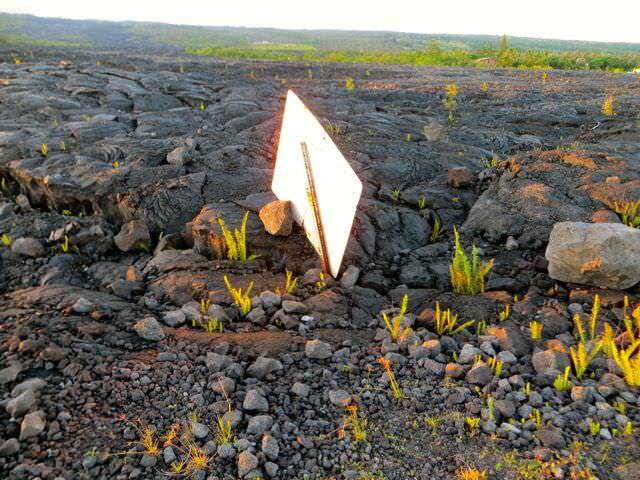 Sputtering and erupting on a near continual basis since the early 80’s, Kilauea and the potential to get a close-up view of what goes on in the stomach of the earth, is something that draws people from around the world to Big Island’s shores. An average looking road…that skirts a volcano crater. 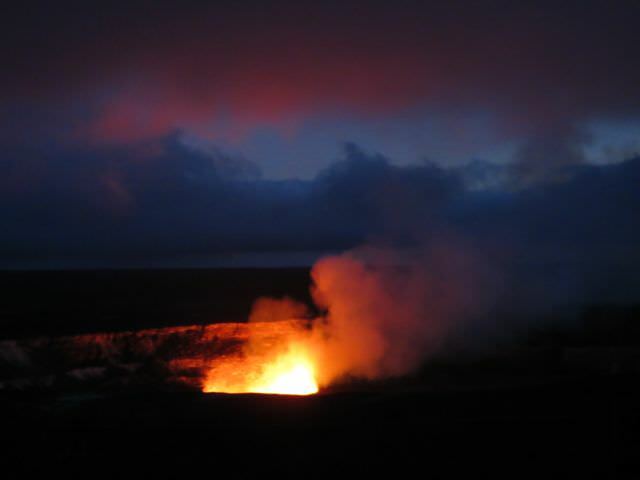 Arriving on Big Island and with a volcano-driven agenda, I quickly made friends with some fellow travellers who had a rental car and were planning to visit Hawaii Volcanoes National Park. Less than 24 hours later, I found myself cruising around what could definitely qualify as the world’s weirdest road: Crater Rim Drive, an 11-mile circular route that plots a path around…you guessed it…the rim (caldera) of the Kilauea volcano. It’s hard to imagine while you’re gliding over the flat, well-maintained surface which honestly looked like many roads I’d travelled on before, that you’re skirting the permitter of a volcano crater. Yet, the road serves an excellent purpose for those with limited time, interest or energy, who can use the ring road as a a basis for seeing some of what the park has to offer including, steam vents, a lava tube, the museum and direct, drive-up access to an overlook where, conditions being right, you can watch the volcano in action. Not much less dramatic (name included), Chain of Craters Road is an alternative driving route that heads downhill for around 20 miles towards the ocean and offers a different way to explore the volcano. As exciting as both roads may sound, they can close on a whim depending on the activity of the volcano. Crater Rim Drive was partially closed during my visit meaning it wasn’t possible to do a complete loop of the crater by car. But that didn’t really concern me as my interest lay in exploring the park by foot. There are many different types of trails to hike in the park complete with varying sights, lengths and levels of exertion to be had. A good summary of some of the trails can be found here. Weighing them up, I decided to take the Kilauea Iki Trail because a) it had been recommended to me by someone who had visited the park previously (always a good reason for doing something), b) didn’t require a permit, c) could be completed before sunset (when I wanted to head to the overlook) and d) took me past the kind of terrain that excited me – lava tubes and steam vents. It’s also one of the most popular trails in the park…and for good reason. 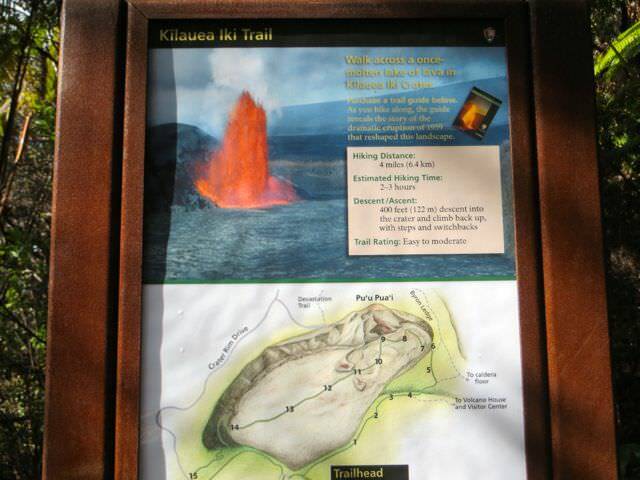 Although the Kilauea Iki Trail is often described as an easy to moderate hike, it’s probably going to be one of the least exhausting ways to experience the inside of a volcano crater. Not only was it world’s apart in ease terms compared to volcano hikes I’d done in Latin America, the hike was less strenuous than the walk up Pompeii (something I did after visiting Hawaii). Exertion level aside, out of all the volcano hikes I’ve completed, I’d say this was one of the most impressive…perhaps only to be beaten by the hike into the crater of Haleakala on Maui, another challenge I accepted a month later. The trail started off with a fairly gentle downhill descent through tropical forest greenery (one day I’ll learn the name of the plants well enough to call them something other than “greenery”). Winding slowly, the trail reached a point where there was no other way but down and I took the descent over giant boulders for about 400 feet into the crater. For a sense of perspective, see the white dot in the distance on the left – that’s a human! It was one of those moments, which I went on to have a lot of in Hawaii, where I stood in a place that was like nothing else I’d seen on earth. From one side to the other, the crater floor looked like a giant had wielded a sledgehammer and cleaved up the earth’s crust into double-human sized chunks. Feeling like a child starring in “Honey I Shrunk the Kids”, I picked my way cautiously over the unfamiliar terrain paying close attention to the uneven surface that was frequently interrupted by gaps in the ground wide enough to fall through and into what I assumed would be the hottest, darkest pits of hell. The closer I wandered toward the epicentre of the crater, the more troubled I became. Sure, this particular crater wasn’t active…currently, but it was certainly getting warm underfoot. Worryingly warm. I’ve stepped on a lot of hot ground on my travels but I’d never experienced this level of underfoot warmth. And this experience was through my thick soled running shoes…which I started to work that bit faster. The natural underfloor heating wasn’t the only reason I was keen to progress out of the crater. Still suffering from a cough after getting sick in Oahu, I realised that inhaling the produce of the steam vents wasn’t having the most pleasant reaction with my lungs and I began to cough chokingly. With a wave of “I’m alright” to my walking comparisons, I picked up a near jog as I negotiated the tabletop shaped crusts of land to the crater’s opposite site, watching not to wade into the path of whispy steam vents as I went. Finally breathing (slightly) less sulphurous air, I looked back over the terrain still filled with sheer awe before making the ascent back up to the road. The climb up was a bit of a cheat. While the amble down had allowed a pleasant pace at an equally pleasant gradient, the route up covered the same distance in half the space, making for a more vigorous incline. Humid jungle accompanied the hike and by the time I reached the top I was hot and parched. Tip: at a slow pace that permitted time to chat, choke (just me) and take endless photos, the hike took around 2 hours. Grabbing a second bottle of water from the car, it was time to treat my body to a change in climate with a walk through a cool, dank lava tube. Standing inside the rather round, cave-like but 21st century lit space, it was hard to fathom the reality of where I stood. In fact, had I somehow wandered into the tunnel oblivious, I would never have guessed at its creation. Excusing my geological simplicity (more complex stuff here), Lava tubes are what’s left behind after a stream of hot, molten lava has forged a route from one location to another. As the top layer of the lava flow cools and then crusts, it creates a tube which acts as a conduit for further lava to flow. 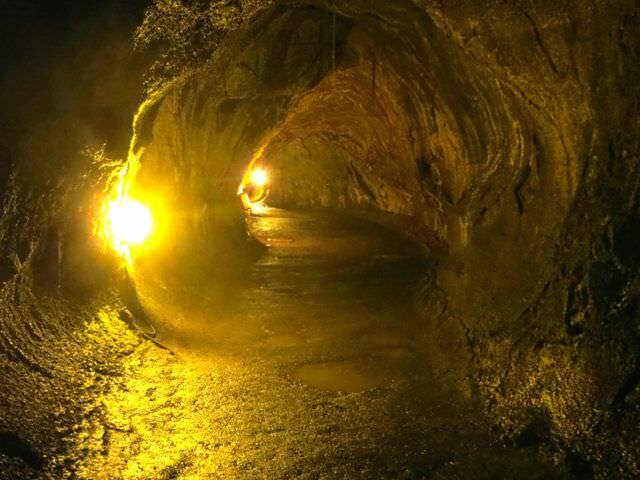 Once the lava stream has ceased, what remains is a tunnel evidencing what once happened. Popping out of the crater after the uphill hike, it was a short walk across Crater Rim Road to Thurston Lava Tube, one of the park’s most accessible and frequented lava tubes. Perhaps I suspected more mystique about the tubes but stepping practically off the road and into the tall, cavernous space, I had to repeatedly remind myself what I was standing in (a 500 year old lava cave) to fully appreciate the marvel of the tube. About twice my height (stood on my tip-toes with my arms in the air) and multiple times my width, the tube took several minutes of exploration before reaching the end. After the lit section, an entirely darker tube exists that requires good footwear and a powerful torch. This is the sight at the overlook just before sunset. 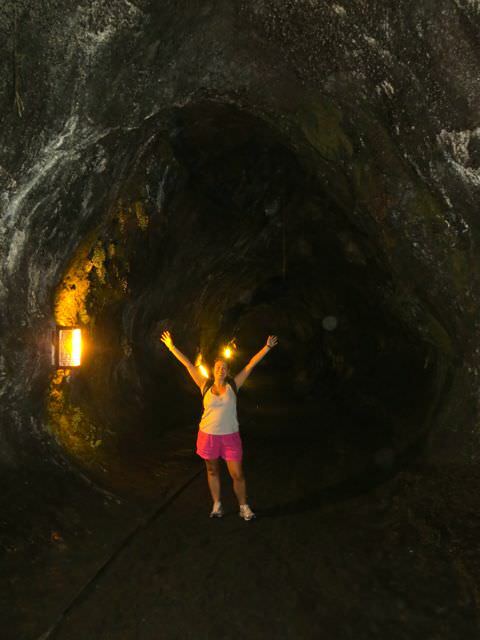 Completing the hike, wandering through a lava tubes and dodging steam vents went a significant way towards scratching my volcano itch in the park but what I really wanted to see was some lava. The problem I quickly discovered on arrival on Big Island is that lava is a fickle, unpredictable and unreliable beast and although conditions had been dramatic and impressive just months before, the above ground flow has all but tapered out to nothing during my visit. Absent a wild-lava chase in the middle of the night, which was costly and didn’t promise huge degrees of success, my next best opportunity was to see the lava glowing inside the Halema’uma’u vent. 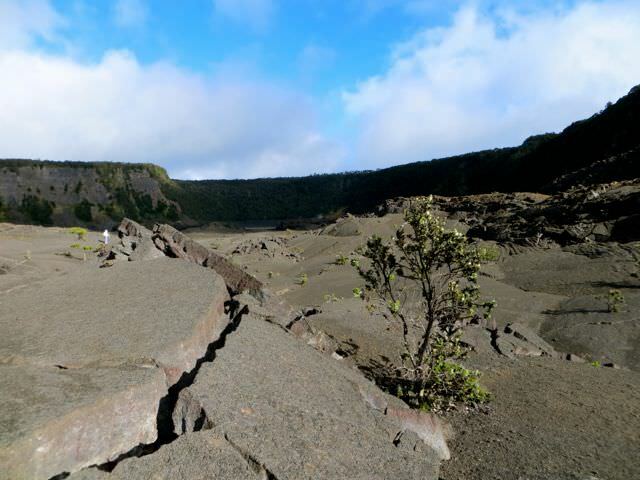 It wasn’t until relatively recently (2008) that that the crater of Halema’uma’u has become watch-worthy. 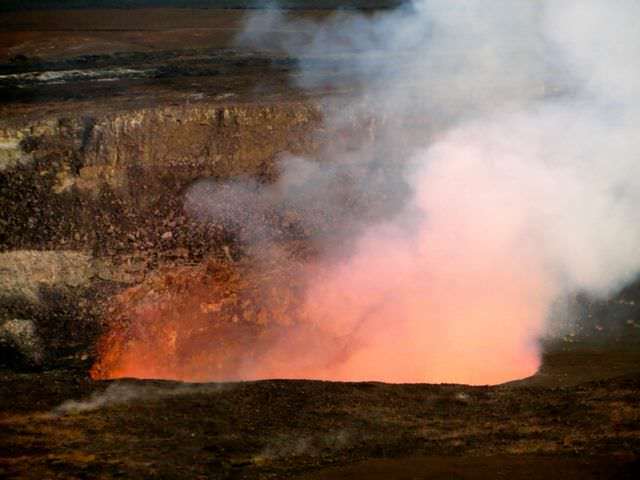 After decades of inactivity, an explosion opened up a 300ft vent in the crater offering a chance for spectators to stand impressively close and ogle at the glow of lava and steam coming from the earth’s stomach. (At time of writing, activity was still going on in the vent). As the sun sets, the view becomes more dramatic. 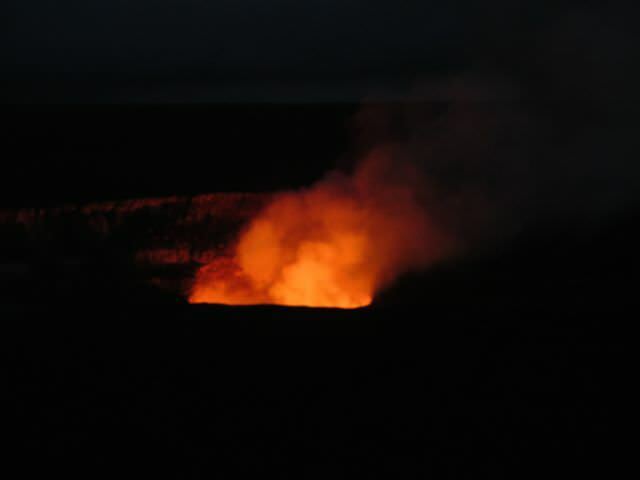 Again, on the advice of a local, I found out that the best time to view the vent is at dusk when the natural light dips to nothing and the eerie, fiery glow from the crater can contrast against the ever darkening sky. After passing the day patiently, finally it was time to see some lava. When the sky is black, the vent looks its most ferocious. Arriving just before sunset, the overlook, which is conveniently (thanks, nature!) located just outside of the Jagger Museum, was already getting busy. After a quick whirl around the inside of the museum to introduce myself to Pele, the Goddess of Fire who, legend has it, calls the Halema’uma’u crater home, and see artefcats such as lava melted boots, I headed outside to jostle into a viewing spot. Space was limited along the wall that creates a boundary between the viewing area and the “not safe to stand” zone and tensions were high as tripod wielding photographers who hadn’t arrived as early as perhaps they should, tried in earnest (involving at least one tripod leg in my back) to get a better spot. For around an hour I stood mesmerised at the slowly smouldering vision in the near distance, glowed ever more fiercely as night took hold. Eventually, my camera memory card full and a chill starting to set in, it was time to call it a night and leave the park. Whole areas of the island can be closed at a moment’s notice. 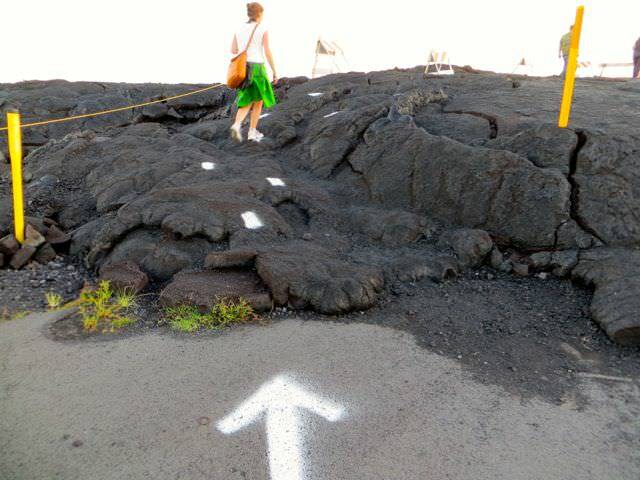 Over the following weeks, I explored Big Island in more depth, searching for more lava (none was found) and following the path that past eruptions had formed. Moreso than my visit to the the park, it was during my time elsewhere on the island, most particularly heading in the direction of the town Puna, I came to understand a bit more about how unpredictable life is on Big Island. A road sign consumed by nature. There is a curious upside to the volcanoes’ lava spewing activity – Kilauea has single-handedly been responsible for expanding the land mass of Big Island by half a kilometre. In short: paradise is still growing. Of all the volcanoes I’ve met, none have been in the process of the rare act of giving birth to new stretches of earth. And, in a world where land ultimately equates to real-estate and therefore money, this might seems like a good thing for the island in the long-term (imagine half a kilometre of land suddenly appearing in Central London or Manhattan). However, as fascinating as this act is for people to watch, there’s no doubt that Kilauea has had an impact on the people who live in the volcano’s vicinity. Driving out towards Puna, one of the locations where lava more recently forged a path, and where many of the lava tours can start from (conditions being right), it didn’t take long to reach a halt in what had once been the road. And this is where the road used to be. As lava from the volcano oozes, creeps and charts a course that can’t be controlled over the land of Big Island, roads disappear, residents are forced to move and life can change on the whim of nature. With road signs all but consumed, houses displaced and the road completely repaved by nature, a bubbled, black landscape of cooled lava crust replacing what had once been, I saw that life lived at the hand of volcanic activity can be disruptive at best and devastating at worst. A house built on new ground. Some locals have resisted the change as best they can, returning to plots they once called home, placing foundations on a crust that, I personally wouldn’t be sufficiently confident to take the weight of my home (although lava gains a hard crust when cooled, it can remain “runny” underneath not unlike those molten chocolate cakes I enjoy so much). Residents have returned in small numbers. Circumstances are transient for tourists too. 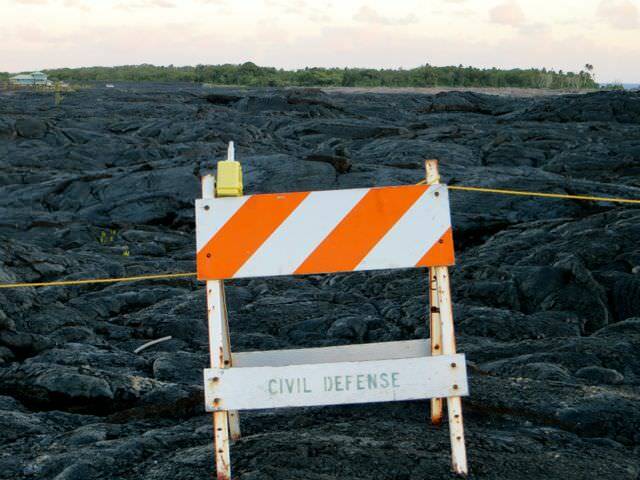 Many roads had been closed during my visit in the aftermath of Kilauea’s recent activity, where it had chosen a path to spew into the sea. A month or two earlier and I’d have been able to hop on a boat and witness the awe of fire-hot lava spewing into and cooling as it hit the sea. Instead, most of the activity was focused in the crater during my stay. If you try to understand one thing about Big Island before you go, it’s that things can change quickly, particularly around Kilauea. Don’t assume that there will be lava activity, don’t expect to be able to drive where you’d planned, and above all the best trip will come where your attitude is as resilient of the residents and plans as fluid as the flow of the lava. Kilauea is not known for the kind of dramatic eruptions that send the volcano’s innards (lava and volcanic rock) firing into the air. Overall, this makes it a reasonably safe sight to see – local cautionary advice accepted. As impressive as the overlook at the Jagger Museum is, it won’t satisfy you if you are intent on seeing oozing lava up close. 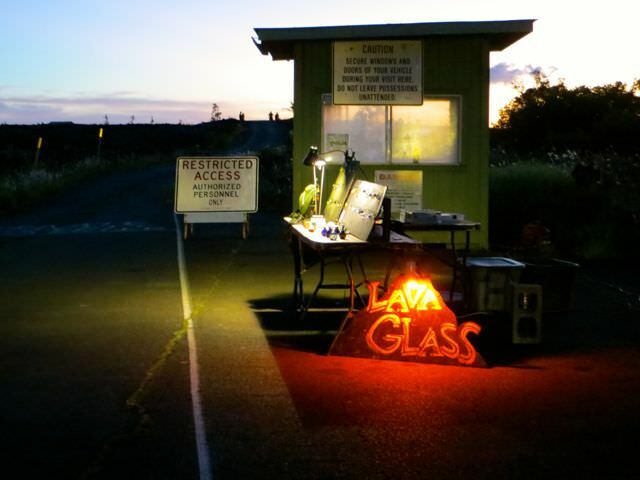 There are a number of tours you can take in search of the stuff but they can cost upwards of $100, require hiking over lava crust in the dark and not necessarily promise results unless the lava flow is active above ground. I researched the possibility of doing the search without a guide and quickly found out this would involve trespassing on land sealed off by the government (although, interestingly it’s the same land the guides are permitted to take tours on), but more worrying, it’s easy to go off course and find yourself knee deep in crushed crust and molten lava that may look secure to step on but is unstable underneath. If you do go it alone, one of the best ways, I was advised, to understand whether the black crust is safe to stand on is whether plant life is present – plants usually only grow after a could of years, usually enough cooling time to make the ground solid. However, taking a guide is the much safer bet. If you want to undertake one of the more challenging hikes in the park, be aware that you may need to arrange a permit in advance. 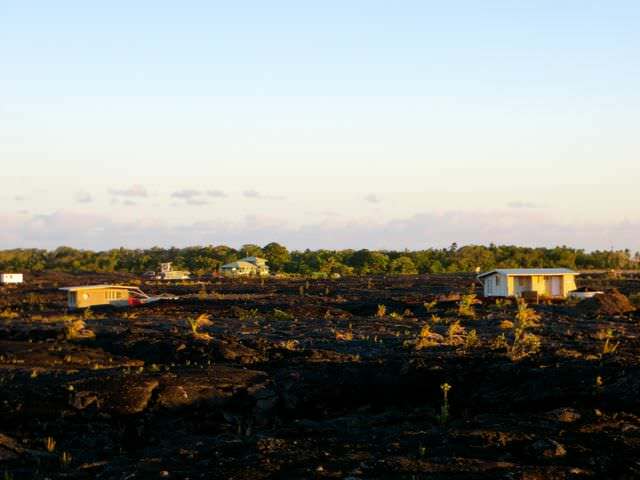 If you’re visiting Big Island purely or mainly for the purpose of visiting the park, Hilo is is a great, affordable place to stay as you can access the park by car in around an hour. Although you can drive to the park from the west side (near Kona), you’ll spend as much time in the car as you will at the park. 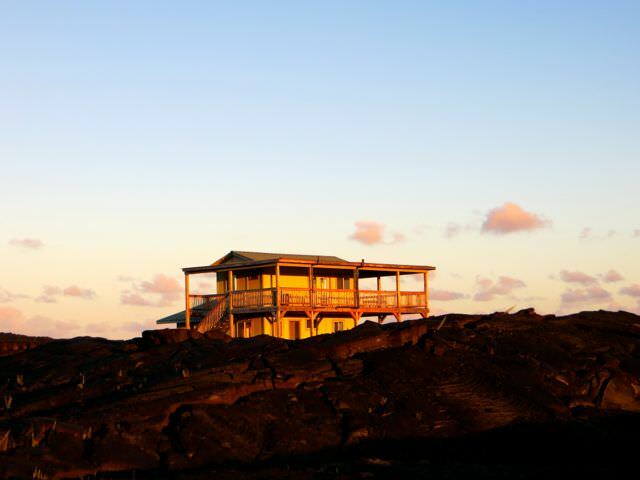 If your budget allows, there is a hotel, Volcano House, located inside the park on Crater Rim Drive otherwise Volcano Village (I know – love the name) is your next closest bet. Entry into the park is $10 per vehicle or $5 per individual and is valid for 7 days. 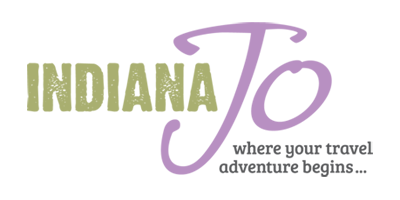 You can buy your pass online, though it isn’t necessary to book in advance. 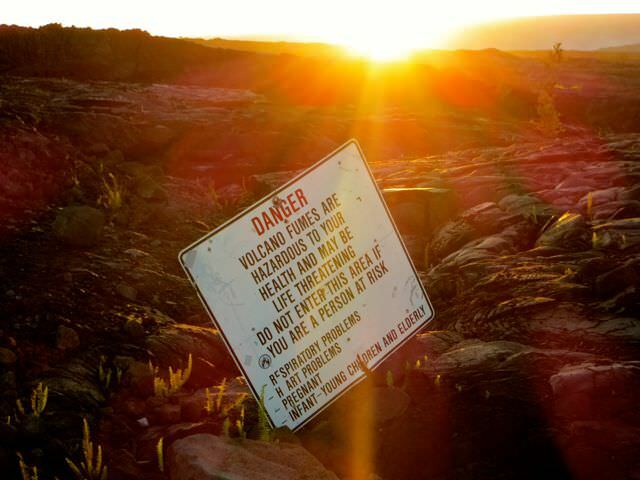 More information about the Hawaii Volcanoes National Park and opening hours can be found here. 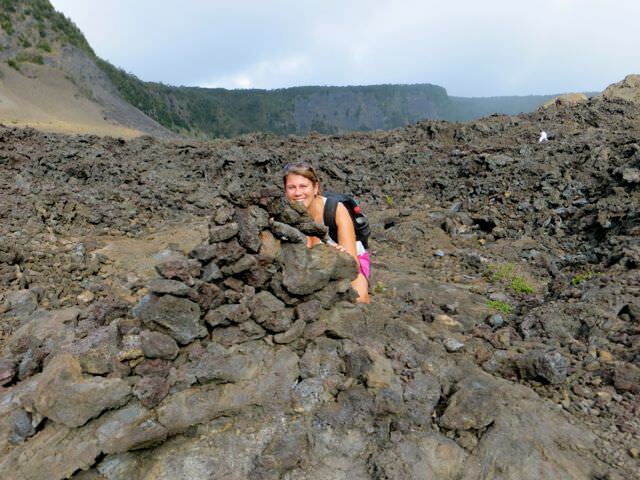 Want to read about the time I hiked down a volcano barefoot? Check out my interview with Secret Compass. 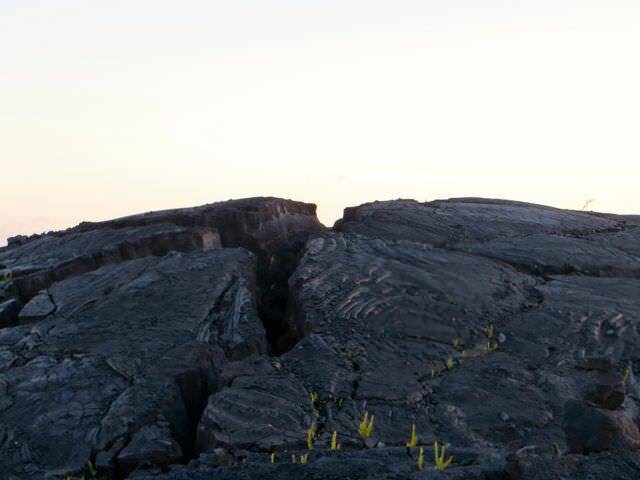 Have you been to Hawaii Volcanoes National Park? 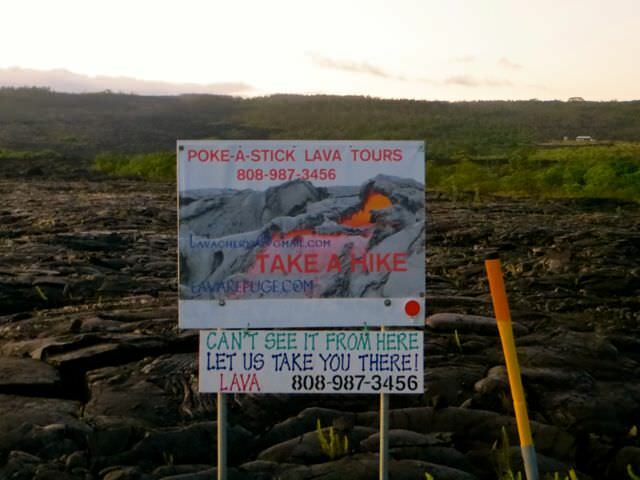 Did you see any lava? 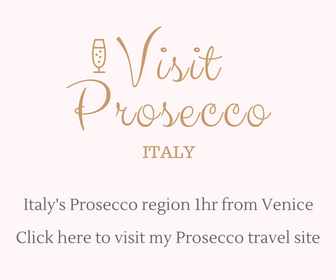 Any other travel tips or experiences to share? 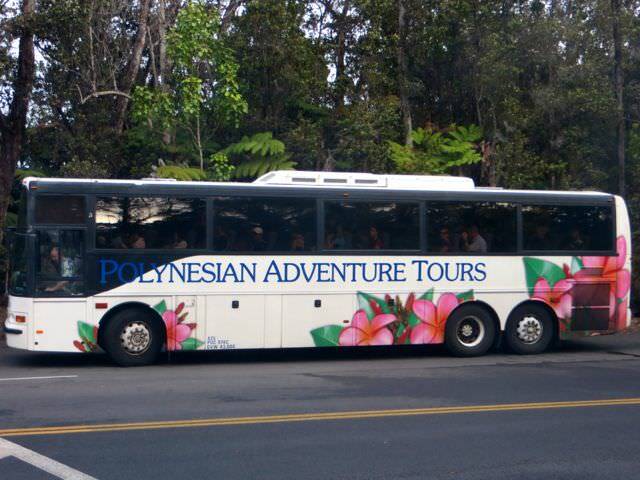 Want to read more travel planning tips for Hawaii? Click below. Jo, We visited Mauna Lea years ago, and it really was more inactive back then. I would love to go again. Great post!